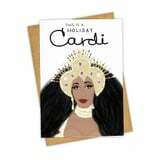 Whether you're into pop culture and celebs, naughty holiday references, or just funny puns in general, you will be living for these greeting cards. Stamp 'em up and send them on their way. We promise your friends will love this holiday kind of humor.